Cape Town Tandem Paragliding offers a great and unique gift idea in the form of a Tandem Paragliding Gift Voucher. 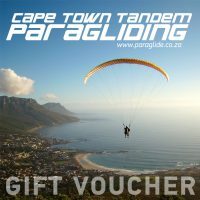 To purchase a Tandem Paragliding Gift Voucher from Cape Town Tandem Paragliding contact us. Pricing: same as normal flight (see information). Valid for: 4 months (from date of purchase). We will then make out the voucher and email it to you. You can then print out this voucher and give it to the recipient – Easy as that! IF YOU BUY A GIFT VOUCHER ON THE WEBSITE AND PAY WITH PAYFAST THE VOUCHER WILL BE AUTOMATICALLY EMAILED TO YOU AND THE RECIPIENT. Cash, credit card (online only through paypal), EFT or direct deposit. Pay cash if you would like to collect the voucher. Gift vouchers are valid for 4 months as shown on the voucher. Expired gift vouchers will be charged a R200 extension fee if they are less than 1 year old from the start date on the voucher. Vouchers that have expired and are more than 1 year old from the start date on the voucher will not be accepted.